Estimating Services | Champion Construction & Consulting, Inc.
Do You Need An Estimate Of The Damages To Your Home or Business? If you have experienced a flood, fire, storm damage, or other type of disaster to your home or business, you’ll need to know what it will cost to repair the damages and rebuild. Oftentimes on larger losses, insurance adjusters lack the experience or time to provide the level of detail and/or sufficient funds needed to restore or replace all the building components that may be affected. We specialize in restoring homes and businesses damaged by all sorts of man-made and natural disasters, which gives us knowledge and experience you can depend on to write the most comprehensive and accurate repair cost estimate. With over 37 years of construction, restoration, and estimating experience, we know what it takes to assess damages and compile an accurate estimate that reflects what it will take to restore your building to a pre-loss condition at today’s costs of rebuilding. Once we have the basic information on your project, we will set up a time to call you and discuss more details of your project. We can usually turn around an estimate within 24-48 hours. 37+ years of experience in the construction and restoration industry, having worked on literally thousands of restoration and construction projects. Estimates created with the Xactimate estimating software that most insurance carriers recognize as well as other unique tools. This makes bid comparisons, pricing verification, and claim settlement simplified. The ability to provide an independent and unbiased opinion of each situation and appraise the correct methods of repair with the utmost attention to detail. The ability to effectively communicate complicated, complex, or unusual repair issues that many times are omitted, underestimated or overlooked. We document in detail the reasoning for unusual repair costs or difficulty factors. The ability to inspect losses or provide bid comparisons where others may have not accurately assessed the damages. We review pre-existing estimates and identify items that may have been overlooked or overestimated. The availability to assist insurance adjusters when they can’t bring in a contractor to assist them. This allows the insured to choose their own contractor, expedites the claim process, and significantly limits contractor problems. Accuracy in identifying the repair actions and costs necessary to repair damages to the quality and standard that existed prior to the loss occurrence. The Champion Estimate: This covers estimating the cost to repair your damages based on the nature and scope of your damages, the repair methods appropriate to your situation, the repair actions necessary to repair your damages, and the prevailing local costs for labor and materials. The Champion Estimate allows you to present your own independent analysis of the necessary repair actions and how much the repairs will cost at prevailing rates, including labor, materials, supervision, and contractor overhead and profit. The Champion Un-priced Scope of Work: This report describes the repair actions necessary to repair your damages but omits repair cost pricing information you may want to keep confidential. This allows other contractors interested in bidding on the work to bid on one master scope of work so everyone bids apples-to-apples. The Champion Differences Summary: This report compares the repair actions proposed by an insurance adjuster or the contractor brought out by the insurance company with the repair actions listed in the estimate provided by your contractor or The Champion Estimate and identifies each repair action omitted or overlooked by the adjuster or their contractor. 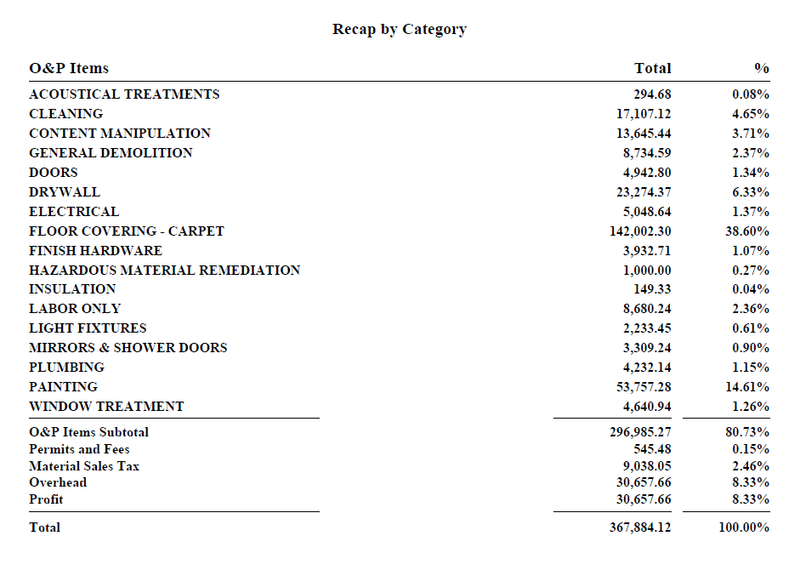 This summary shows only the items that are not reflected in the estimate provided to you by your insurance company or the contractor that was brought out by them.